Try this delicious soup when you are looking for a quick and easy supper dish. 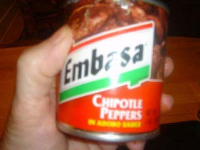 The outstanding ingredient in it is Chipoltle in Adobo Sauce. These are smoked jalapena’s in a chili-vinegar sauce; and they really add a special taste to dishes such as soups, stews, and beans. The chipoltes should be chopped and you can add the sauce according to your taste. To cook the chicken, season it on both sides with salt and pepper while heating the chicken stock in a saucepan. Slip the chicken into the stock and simmer gently for 20 minutes. Remove the chicken and let cool, saving the stock for the soup. To make the soup base, cook the onion with half a teaspoon of salt in the oil until softened. Stir in the garlic and cook, stirring, another minute. 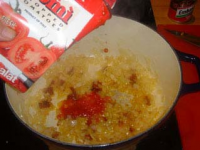 Stir in the tomatoes, with the chipolte and its sauce. Cook, stirring, another minute. Then stir in the chicken stock. Bring to a simmer and simmer gently for 5 minutes. Taste and adjust the seasoning. 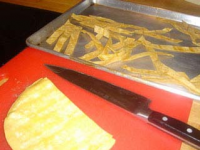 To prepare the garnish, cut the corn tortillas into 1/2-inch strips, place on a baking sheet in a 400 degree oven until they are crisp. 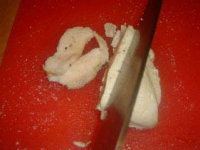 Slice the chicken into 1/2-inch strips; do the same with the avocado. 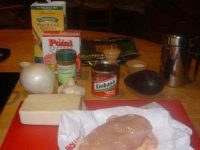 To serve, stir the chicken and avocado into the soup. 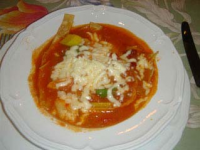 When heated through, ladle the soup into bowls lined with tortilla strips and sprinkle over the cheese.